Whew, what an emotional night! I shed some tears - some happy, some sad. Last night was the big Tim Gunn make-over show and it was fun to watch. I thought everybody looked great but Tara looked amazing! It was sad to see Mike's brother, Max, fall apart when he saw how good his dad and brother looked after their makeovers. Max felt like the odd-man-out, being 'the big one' in the family. Mike told his brother that he and his dad would help him lose the weight too. Another sad event was learning that Laura had suffered a stress fracture to her hip. Dr. H. told Laura she couldn't do any weight-bearing exercise until her hip bone healed, which would take at least 3 months. Adding insult to injury, Laura gained 3 pounds at the weigh-in. Ugh! Mike won the all-time record for the most pounds lost while on the ranch (145 pounds in 15 weeks - WOW!). And Helen lost an amazing 7 pounds! Due to Laura's hip fracture, she had to be carried to the scale by Filipe and Mike. Laura sent Sione home last week so it was interesting that Felipe's vote is what sent Laura home this week. In my opinion, the group made a bad game move. They should've sent Kristin home. since she is by far the bigger threat. Laura Denoux is a 24 year-old Sales Director (and former plus-size model) from Miami, Florida. 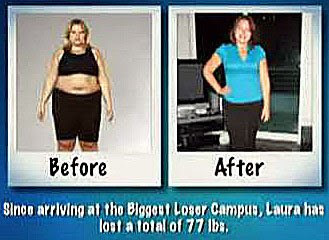 Laura weighed 285 pounds when she arrived on The Biggest Loser ranch. At the time of her "Where Are They Now?" video, Laura weighed 208 pounds, for a total weight loss of 77 pounds! 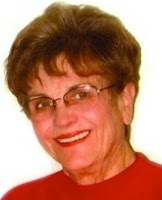 She is tickled that despite her hip injury, she's been able to workout regularly and maintain her weight loss. Laura's goal is to continue losing weight and hopes to reach her goal of losing 100 pounds by the finale. "I love my new life. I can't believe how much losing 77 pounds can do for somebody. The Biggest Loser has definitely changed my life forever." I know! I felt so bad for Max! I hope they can help him lose weight, poor kid! I can't believe how good Tara is looking. She's gonna be a toothpick before it's over with! They are all looking great! I love reading your recaps here because I'm afraid BL didn't make it on my Tivo list this round. Kelly - I felt bad for Max too. He's just broken-hearted... torn between feeling happy for his dad and bro and sad for himself. I know they will do everything they can do help him when they get home. Sadie - I know! It's unbelievable!